Caring for your pup is your top priority, and there’s a lot that goes into taken care of him. Grooming is one of the most important parts of dog care. Pups have the tendency to get messy. They like to explore, roll around in mud, garbage, and even excrement; it’s just their curious nature! And when they’re exploring, they tend to get dirty and stinky. But what do you do when your dog doesn’t like to take a bath? Or, what happens if your furry friend is always getting dirty, but you don’t want to wash him too much for fear that you’ll dry out his skin and coat? Using a dry shampoo is the perfect solution! What is dry shampoo for dogs? Basically, it’s just like dry shampoo for humans, but it’s specially formulated to meet the needs of a dog. Interested in learning more about a dry dog shampoo? Wondering what the benefits are and what options are available? In this review, we’ll take a look at waterless pet shampoo, but first, we share our top five picks for the best dry shampoo for dogs. What is Dry Shampoo for Dogs? Why Use a Dry Shampoo for Dogs? Now that we’ve shared our top five recommendations of the best waterless shampoo for dogs, we’ll offer more details on each product below, including why we like them and what other users are saying. When you’ve decided which one will best meet your pup’s needs, just click on the buttons to find the best price available on Chewy and Amazon. 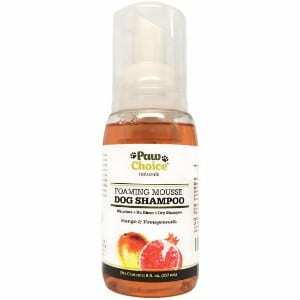 Our first pick for the best dry dog shampoo is Paw Choice Naturals Foaming Mousse Waterless Dog Shampoo. This waterless dog shampoo is made of natural coconut and contains no harsh chemicals, like sodium laureth sulfate, alcohol, parabens, or sulfates, so it’s safe for your pup’s sensitive skin. You also don’t have to worry about it washing off any topical flea treatment for dogs. Paw Choice Naturals Foaming Mousse Waterless Dog Shampoo will refresh and deodorize your dog’s coat, leaving behind a delightful mango and pomegranate scent. This dry dog shampoo will also condition your pet’s skin and coat. Using this product is so simple: Just pump the foam onto your hands or directly onto your dog, gently work it into his coat, and allow it dry. This dry dog shampoo is perfect for touch-ups between full baths. It can be used on dogs of all ages, sizes, and with all different types of coats. So, whether you have a long-haired Cocker Spaniel or Shih Tzu or a short-haired Great Dane or Put – or any other breed – this dry shampoo for dogs will keep your furry friend refreshed and smelling great! Paw Choice Naturals Foaming Waterless Dog Shampoo is cruelty-free, is made in the USA and adheres to the strict regulations of the EPA. It’s also backed by a satisfaction guaranteed; if for any reason, you are not satisfied with this product within 30 days of purchasing, you’ll receive a full refund. Users say they like this product because it refreshes their dogs’ coats with a pleasant, non-overpowering smell, and because it’s so easy to use. If your Golden Retriever, Maltese, Miniature American Shepherd, or any other breed that you may have needs some freshening up in between baths, than you’re going to love Wahl Natural Pet No-Rinse Waterless Shampoo. This dry dog shampoo is comprised of natural plant based botanicals that offer powerful cleansing properties. It’s also free of harsh chemicals, such as PEG-80, parabens and alcohol, so it won’t irritate your dog’s sensitive skin. 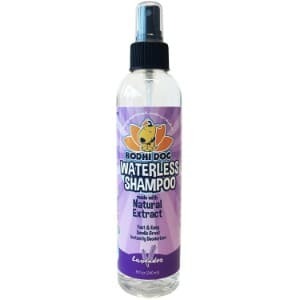 This waterless pet shampoo also contains oatmeal extract, which helps to sooth dry and itchy skin. It also offers conditioning properties that will moisturize your pup’s coat and actually penetrating and locking in the natural proteins and sugars that it contains. The lavender chamomile fragrance will eliminate all types of odors, leaving behind a refreshing scent that isn’t overpowering. Using Wahl Natural Pet No-Rinse Waterless Shampoo is so easy! Simply pump some of the foam onto your hands or apply it directly onto your dog, work it into his coat, and towel dry or air dry. That’s it! Your pup will look and smell like he just stepped out of the bath or came back from the groomer; and the best part is that you won’t have to deal with the struggle of giving him a full bath or spend a ton of money on professional grooming! Users give this waterless shampoo for dogs two thumbs up! They say that it’s easy to use, has a lovely scent, and that it’s the perfect solution for pets that don’t like taking baths or who just need a touch-up between a full bath. 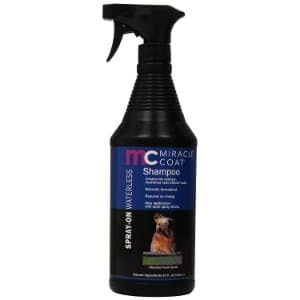 Next up on our list of the top dry shampoos for dogs is Miracle Coat Dog Shampoo. Though this waterless dog shampoo is a bit pricier than other options, it’s definitely worth the investment. It’s made of natural, pharmaceutical grade ingredients that have been proven to be safe and effective for use on all dogs and all skin types. Not only will it remove built up residue, but it will also freshen and moisturize your dog’s coat and skin. This dry dog shampoo offers conditioning qualities that will leave your furry friend’s coat looking great and easy to manage. Unlike the previous dry dog shampoos on this list, which were foams, Miracle Coat Dog Shampoo is a spray. That means that you can apply it to your pup without having to make physical contact with his skin or coat; however, once you apply it, massaging it in is recommended to achieve optimal results. Worried that your pet will be spooked by the sound of the spray? The makers of this waterless pet shampoo thought about that and made the sprayer noisless. Your pooch won’t even know you’re applying it! Miracle Coat is a highly regarded manufacturer of rinseless dog cleansers. This shampoo is made of the highest quality ingredients and is safe to use on dogs of all sizes and breeds. In fact, if your furry friend has dry skin, this product will actually provide fast relief! Users have said that Miracle Coat Dog Shampoo is easy to use and that it offers outstanding results. It not only cleanses the coat and skin, but it actually effectively relieves dry, irritated skin. Pawstruck Natural No-Rinse Pet Shampoo is another great choice for freshening up your dog between baths or trips to the groomer. It’s safe for use with all types of coats and skin. It’s pH balanced for a dog’s sensitive skin and effectively soothes itchy and inflamed skin. 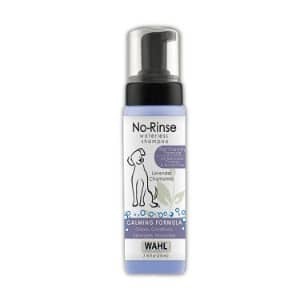 If your pup is suffering from allergies, dermatitis, or any other irritation, than this no rinse dog shampoo is an excellent option to consider using. Not only will it offer him fast relief, but it will also leave him smelling great and leave his coat easier to manage. 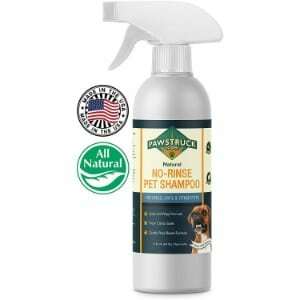 Pawstruck Natural No-Rinse Pet Shampoo is made in the USA and adheres to the strict regulations that are set forth by the EPA. It’s a cruelty-free waterless shampoo and it’s completely free of harsh chemicals, such as phosphates, DEA, MEA, sulfates, parabens, and artificial dyes. This dry shampoo for dogs is also non-GMO, vegetarian, and vegan, and it completely biodegradable. Even the packaging that it comes in can be recycled! This formula is non-toxic, so you’ll have peace of mind knowing that your pet will never be in harm’s way, and it’s also safe to use with flea and tick treatments. Using this waterless shampoo for dogs is so easy! Just spray it onto your pup’s skin, work it in, and allow it to dry. Your pet will be instantly refreshed and smell great, too! This product is also backed by a satisfaction guarantee; if you’re not happy for any reason within 30 days of purchasing, you’ll receive a full refund. Pawstruck waterless dog shampoo is vet and groomer recommended. Users say that this product offers outstanding results and is easy to use on all breeds, including adult Golden Retrievers and even puppy Greyhounds! Last, but certainly not least, on our list of the best dry shampoo for dogs, is Bodhi Dog All Natural Dry Shampoo for Dogs. This waterless dog shampoo is 100 percent non-toxic and hypoallergenic, making it safe for use with all dogs, including those who are prone to sensitive skin, like German Shepherds and Labrador Retrievers. This gentle formula is made of all natural ingredients and is completely free of harsh chemicals, such as alcohol, parabens, sulfates, and detergents. It also offers a fresh lavender scent, which users say is quite pleasing and not at all overpowering. In addition to removing buildup dirt and debris and deodorizing your dog, this dry dog shampoo will also condition his coat. Users say that running a dog brush through their pet’s coat after using this product is a breeze! Bodhi Dog Natural Waterless Dog Shampoo is easy to apply: just spray it right onto your pup’s coat, work it in, and allow it to dry. That’s it! This product is made in the USA and adheres to the strict regulations of the EPA. All ingredients used are locally sourced and sustainable. You’ll also like that it’s cruelty free and that it’s eco-friendly, too! And it’s also backed by a money back guarantee. If, for any reason, you are not satisfied with this product, you will receive a full refund. If you’ve never used a dry dog shampoo before, you’ve probably got some questions. For example, what exactly is a waterless dog shampoo? Why would you want to use one? And what types of benefits does it offer? As a pet owner, you want to ensure that you are providing your dog with the very best of care. You go to such great lengths to provide him with the very best, like a comfortable dog house, a supportive dog bed, a spacious outdoor dog kennel, a high-quality dog crate, and even a dog playpen so that he can enjoy playing outside when he’s not wearing his dog harness or dog collar. You even go the extra mile to ensure that you are feeding him the very best dog food out of the very best dog bowl. Yes, it’s safe to say that you want the best for your four-legged family member. So, if you’ve never used dry dog shampoo before, it stands to reason that you are going to want to know as much as you can about this product before you start using it on your furry friend. To answer your questions and give you more insight into waterless dog shampoo, we’ve created a detailed buyer’s guide. Below, you’ll find the answers to your questions and learn more about this handy grooming product. When it comes to caring for your dog, grooming is one of the most important things that you can do. Using nail clippers for dogs to make sure that his nails are just the right length, brushing him out with a quality dog brush to remove mats, dead hair, and keep his hair looking neat, and bathing are all a part of responsible pet ownership. Not only does grooming ensure your pet looks (and smells) his absolute best, but it also keeps him healthy and happy! When it comes to bathing, there are several products available, including standard dog shampoo, medicated shampoo for dogs, and even puppy shampoo. There’s dry shampoo, too! Unlike other types of dog shampoos, dry shampoo for dogs is exactly what it sounds like: it’s a grooming product that’s designed to cleanse your dog, freshen his coat, and deodorize him, all without having to give him a formal bath! Waterless shampoo for dogs is very much like dry shampoo for humans. You apply it to your dog’s coat and work it in for instant freshness! No water needed! How do these products work? They contain ingredients that absorb oil, which allows them to remove the buildup of oil that accumulates on your dog’s skin and coat. Additionally, many dry dog shampoos also contain other ingredients that are intended to balance the pH level of your dog’s skin, which actually helps to encourage healthy bacteria and combat those unhealthy, and often smelly ones. A waterless shampoo for dogs should not replace traditional baths or trips to the groomer. These products are not designed to remove as much dirt, oil, and odor as traditional soap will; but, they can be an effective way to keep your dog clean in between baths. It’s ideal for dogs that don’t like taking baths. While it’s true that dry dog shampoo should not replace giving your pup a traditional bath, this grooming supply is a great option for pups who don’t like taking baths. While you will still need to give your furry friend the occasional bath (using a dog treat and keeping him occupied with interactive dog toys can help to make the process easier), a dry shampoo can help to reduce the amount of baths that you give him and keep him smelling fresh and clean. It’s great for dogs that are often dirty and/or smelly. Some dogs are smelly by nature, like Yorkshire Terriers, Beagles, and English Pull Dogs. And other dogs simply enjoy rolling around in dirt, garbage, and other not so pleasant things. While giving your pooch a traditional bath is the best way to get him clean and remove those foul odors, giving him a bath too frequently isn’t recommended. Dog’s have sensitive skin and frequent baths can wash away their natural oils that are meant to protect their skin and coat. Using a dry shampoo is a great way to keep your pup who is constantly dirty or who is regularly smelly clean and fresh without damaging his skin or coat. It makes cleaning large dogs easier and safer. Some dog breeds, like Neapolitan Mastiffs, Irish Greyhounds, Irish Wolfhounds, and Saint Bernards, are excessively large and heavy. If you own a large breed dog, bathing him can be a real challenge. It can be hard to find the space that you need to bathe him in, and getting him into and out of a bath tub can be dangerous for both you and him. If your pup doesn’t like the water, bathing him can be even more difficult. Wrestling with a Great Dane that weight more than 200 pounds, is soaking wet, and covered in soap suds can be end up being completely disastrous. It’s probably in your best interest to have your gentle giant bathed by a professional; but, in between trips to the groomer, the best dry dog shampoo can keep him fresh and clean. These are just some of the reasons why using a waterless shampoo for dogs can be beneficial; both for you and for your dog! You’ll save yourself from major messes, crying, carrying on, and even accidents and mishaps, which means that you and your pup will be a lot happier. The application. There are two main types of dry dog shampoos: foam and spray. With a foam formula, you pump the shampoo out of a bottle, either onto your hands or directly onto your dog, and work it into your pup’s coat and skin. You might prefer this option if your dog moves around a lot or if your pup is a bit skittish, as having to physically rub the product in will ensure that your pet is well covered, and he won’t be scared by a stream of spray coming at him. A spray dry dog shampoo might be a better choice for you if you don’t want to make direct contact with your pet; for example, if he is super dirty or smelly, or if he’s suffering from a skin condition. Make sure you look at the ingredients on the dry pet shampoo. Many products are comprised of harsh chemicals, like alcohol, parabens, sulfates, and phosphates, which can be harmful to your pet’s skin and coat. The best waterless dog shampoos are made of natural, premium-quality ingredients and are free of harsh chemicals. Odor Reduction. One of the main reasons people use dry dog shampoos is to eliminate the foul odors without having to give their pup’s a full bath. While most dry shampoos for dogs are scented, make sure that you are mindful of the scent. Some products are just too overpowering, which is not only unpleasant for you, but more importantly, it can be very upsetting for your dog. Remember, canines have a powerful sense of smell, so strong odors can be very displeasing. The best waterless dog shampoos are lightly scented and will make your dog smell pleasant, but not overbearingly so. While the best dry dog shampoo should not replace washing your furry friend with traditional soap and water, it can be an excellent product for keeping him neat, clean, and smelling fresh in between baths. A high-quality product can also condition your dog’s skin and coat, and can even sooth skin irritations, such as dry, itchy, and flaky skin. This buying guide has been developed to offer recommendations for some of the best dry dog shampoos on the market, and to provide you with valuable information about using waterless shampoos for dogs so that you can choose the best dry dog shampoo that will meet your needs, and the needs of your canine companion.